Kristie Nerby took over Barbra DeVeer's glass business after apprenticing with her to learn the techniques of cutting, fusing, and joining components. Kristie is an entrepreneurial creative soul, who enjoys living in the big outdoors of Montana where DeVeer jewelry is made. 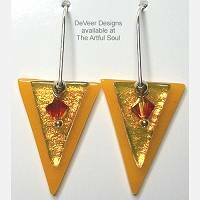 Working with glass is something that soothes her mind along with providing a dose of vibrant color therapy each day, which translates into meticulously detailed jewelry you will enjoy wearing. 2 inches long on sterling earwire, 5/8 inch across. 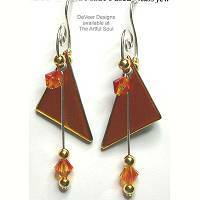 Spiraling wire captures beads and a single triangle flag of fused glass that is fiery metallic orange. 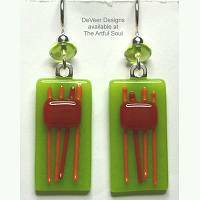 Long wire dangle finishes with another orange crystal bead. 1-1/4 inches long on sterling earwire, 1/2 inch across. 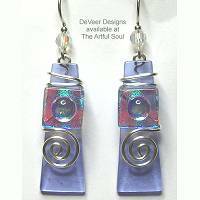 The wire is curved into big spiral that finishes long in back of ear, captures dangling glass in its ornate front flourish. 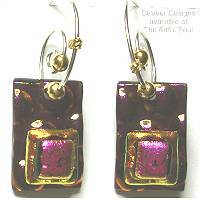 Rectangle of metallic bright pink has a pair of gradually smaller squares fused onto the bottom in more metallic gold and pink. 1-5/8 inches long on sterling earwire, 3/4 inch across. The wire is bent into squared oval to extend from front design, through ear, and caught in the back with self-hook to form closed loop. 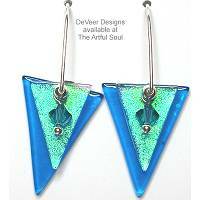 A pair of glass triangles swing freely in transparent dark turquoise blue and iridescent clear with teal crystal bead. 1-3/8 inches long on sterling earwire, 5/8 inch across. The wire is especially long as it curves in front to capture the glass charm, extends long into the back. 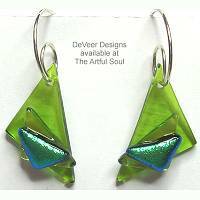 A trio of glass triangles are layered in shades of lime apple green and metallic emerald. 1-3/4 inches long on sterling earwire, 7/16 inch across. Rectangle of lime/apple green glass has orange/red threads fused into it, and red square attached. 1-3/4 inches long on sterling earwire, 7/16 inch across. 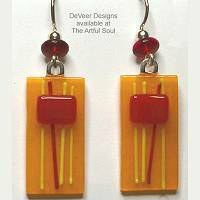 Rectangle of sunny tangerine orange glass has yellow/red threads fused into it, and red square attached. 2 inches long on sterling earwire, 3/8 inch across. 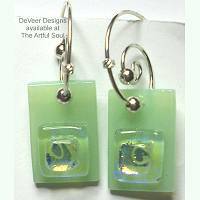 A trio of glass squares are layered and stacked atop the background column of glass, colors are aqua, metallic aqua, and patterned green/aqua, crystal accents. 1-7/8 inches long on sterling earwire, 3/8 inch across. 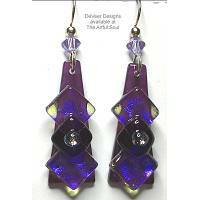 Tapered column of transparent light blue glass has square fused onto it with dot that glow iridescent mint/lavender. Silver wire wraps around the top and back to finish with spiral on the front. 1-3/4 inches long on sterling earwire, 1/2 inch across. 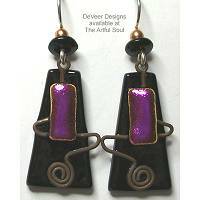 Elongated triangle of black glass has accent of rustic wire bent and spiraled, with metallic pink rectangle fused on top to hold it in. 1-1/4 inches long on sterling earwire, 1/2 inch across. 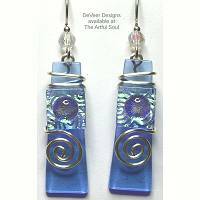 The wire is curved into big spiral that finishes long in back of ear, captures dangling glass in its ornate front flourish. 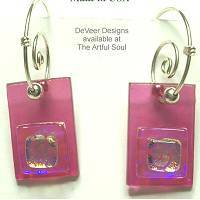 Rectangle of transparent rose pink has a pair of gradually smaller squares fused onto the bottom in iridescent lavender/gold. 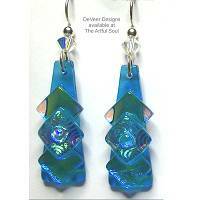 Read about what others think of DeVeer Designs jewelry! Instead of reviews for a specific product, this is a place to share about the designer line in general.